It has been an incredibly busy few weeks, with so much happening. I better just focus on the things to do with Felix or I'll fill up twelve pages! Felix had an appointment with the Neurologist yesterday to talk about booking him in for a follow up MRI scan. For some reason, the hospital made a mistake when they made his appointment and booked him in with a Neurosurgeon instead of a Neurologist. I don't know what it is with some Specialists but, it seems, the higher their qualifications, the worse their bedside manner seems to become. We were totally oblivious to the fact that we had been called in to a Neurosurgeon's office, instead of the Neurologist but, within minutes, the Surgeon realised the error and let everybody know about it. He seemed angry with us, angry with the Nurse and angry with his Intern. Wow! The Nurse rolled her eyes and gave us a little wink and, later, explained to us that what he lacks in bedside manner, he makes up for in skill. He would want to be good, because he was so rude! After his little tantrum, the Neurosurgeon told us that he would be able to order the MRI for us, and see us for a follow up appointment after (I'll be looking forward to that one...not!). He had a look at Felix's previous MRI and doesn't believe he actually has hydrocephalus at all. He thinks he just has larger than average ventricles. There is no fluid build up anywhere, and nothing to indicate anything sinister at all, which is awesome! Felix's head is now measuring on the 50th percentile, well within the normal range. The Neurosurgeon's one saving grace was that he was nice with Felix, so I was really pleased with that. He even commented on how happy and chatty he was, and how long his attention span was, as he sat the whole time and played with one of those frames that you push beads along, up and down. Felix's MRI is booked for early December, so hopefully it will just be routine and the results will be what we expect. I wish he didn't have to have a general anaesthetic, but at least it's just a light one. After leaving the hospital, we took Felix to the zoo. 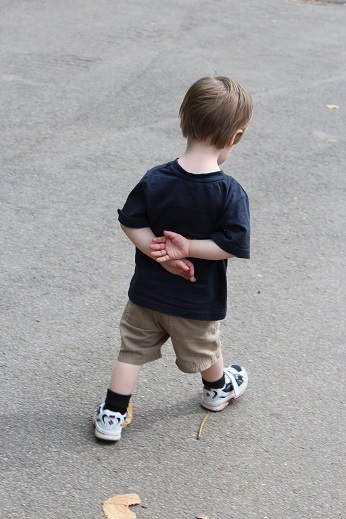 He walked around for about 3 hours, stopping to look at things along the way. 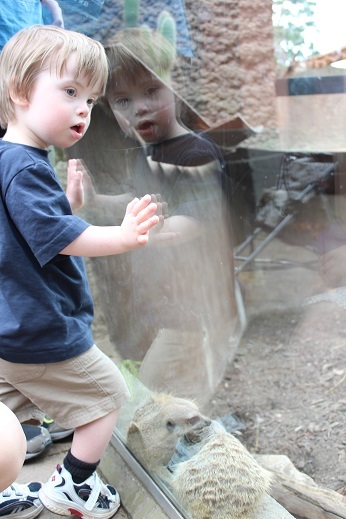 He particularly loved the meerkats because they were so active, running and climbing and looking at him through the glass. He tried to climb the wall to get in with the water dragons and turtles, and wasn't impressed when we suggested it might not be a good idea. 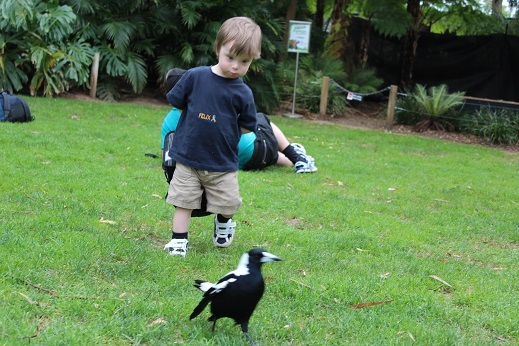 He followed a magpie (native bird) around the lawn. It wasn't bothered by him at all and let him keep walking behind it without flying away. He has a fascination for snakes at the moment and constantly signs 'snake' and says, "Sssssss". 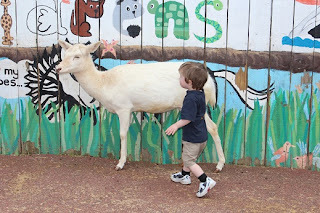 He loved looking at them at the zoo, but we are teaching him the sign for 'dangerous' because the one we found in our yard a week ago was deadly and we don't want him thinking he can pick them up. He loved the monkeys, but was a little scared of some of the noisy birds. 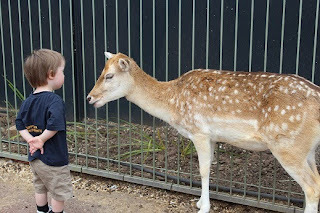 His favourite part was the children's zoo because he was able to touch the sheep, goats and deer as much as he wanted to. They were so tolerant of him as he patted and cuddled them. 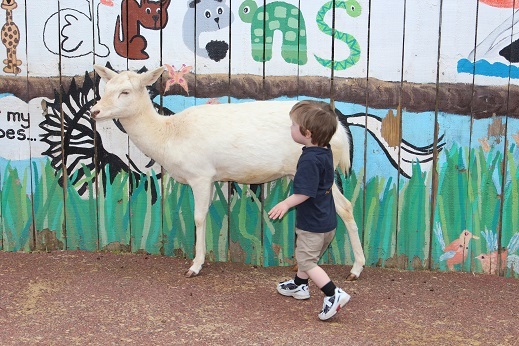 It's hard to believe he was so frightened in a petting zoo only twelve months ago! It was beautiful watching him....I could have stayed there for hours. Today, Felix had his first hydrotherapy session. He hasn't been in a pool for over a year, due to issues with his ears, so I wasn't sure how he would go. He happily put his little wetsuit on, let me put his plugs in his ears and his earband on, and walked over to the pool. From the second we climbed in, with the Physio, he laughed. He thought it was the best thing. The hydrotherapy pool was so warm I could have stayed in there all day! The Physio showed me exercises to try and strengthen Felix's quad muscles, by keeping his legs together as he kicked, and picking up balls with his feet. Swimming on his tummy is always a bit difficult because his head still falls forward sometimes and he gets a mouth full of water but, as the Physio pointed out, it's good to strengthen his neck because he has to hold his head up for periods of time. He enjoyed every second of his session and wasn't happy when it was time to get out. The Physio is wonderful, and so beautiful with Felix. I'm really glad it's going to be a regular part of his therapy. Fingers crossed the ear infections stay away! Such a little old man! (pulmonary hypertension etc). It's never easy to see your child put under an anaesthetic, even for routine surgery and it's hard not to panic, as a parent who cares so much for their child. My thoughts are with all of them, as I know I am in theirs when it is Felix who is in hospital. My heart goes out, especially, to one family whose precious son is currently in critical condition. This gorgeous little man has already bravely faced so much in his short life. He will have to fight as hard as he can to get through the new challenges he faces. I pray that his little body will have the strength to do that! I was reminded again, as I looked around the waiting room at the hospital, just how lucky we are. There were so many children there who had such serious ongoing health issues, and we were able to leave with good news. Once more, I felt such a huge admiration for each and every one of those precious children, who are loved as much as Felix is, and for the strength they show.